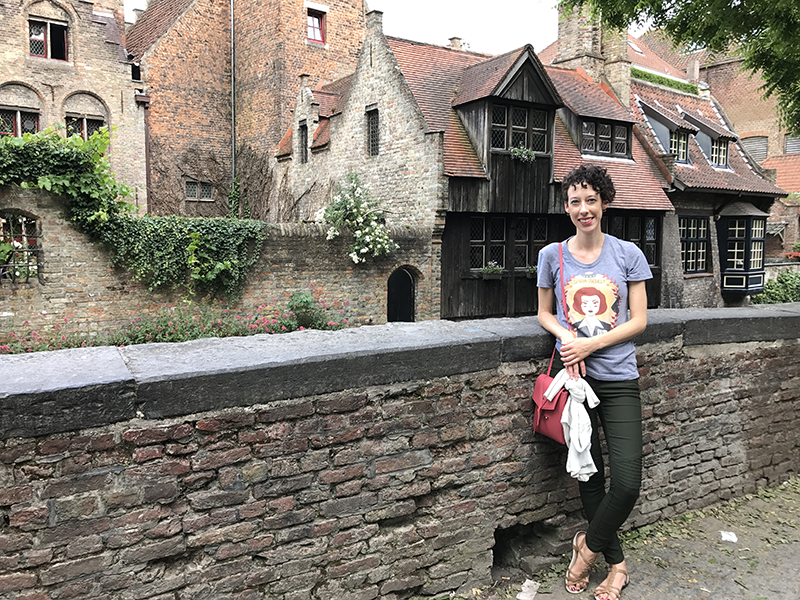 Bruges: the sleeper hit of my recent trip to Holland and Belgium. I booked two nights in this small city on a bit of a whim; I knew it was deliciously quaint and charming, but not much more than that. As a consummate planner and preparer, even this tiny dipping of the toe into semi-spontaneous travel was exhilarating. But then, the night before I arrived, I started to regret my choice. It was a Wednesday night in Rotterdam. I was bored. I was cold. I was heading to Belgium the following morning and I was wondering whether I’d made a mistake. I’d been enjoying Amsterdam so much that by comparison, Rotterdam couldn’t help but disappoint me. (More on that later.) What if Bruges was the same? What if I found myself in a boring, tiny city with nothing to do, nothing to see, and only the relative comfort of a few vegan restaurants to sustain me? Why had I booked two whole nights there without doing more research?! Well. Those fears were, of course, unfounded. My arrival in Bruges felt charmed. The sun was out, the day was warm, and I was riding high after a brief stop in Antwerp to change trains. 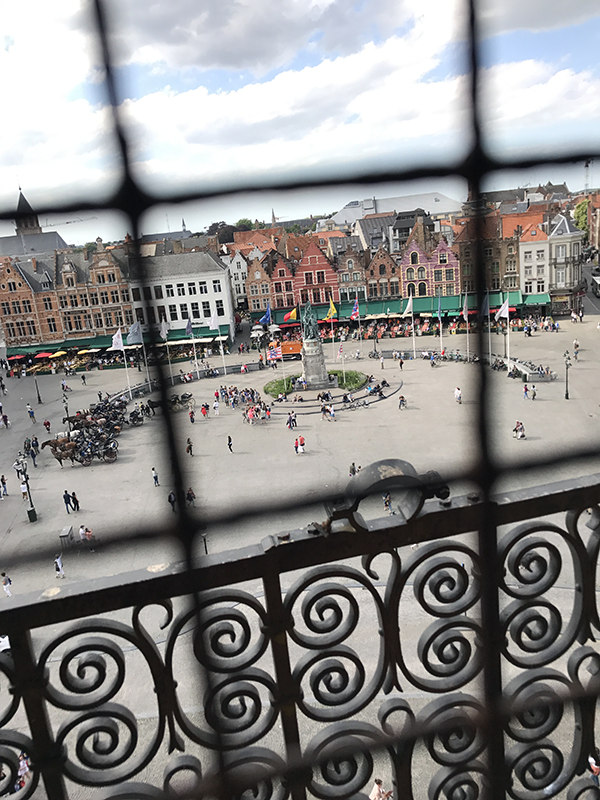 I’d found Antwerp absolutely breathtaking, to my surprise and delight, and my expectations for Bruges were raised in kind. Even the crowd is different. 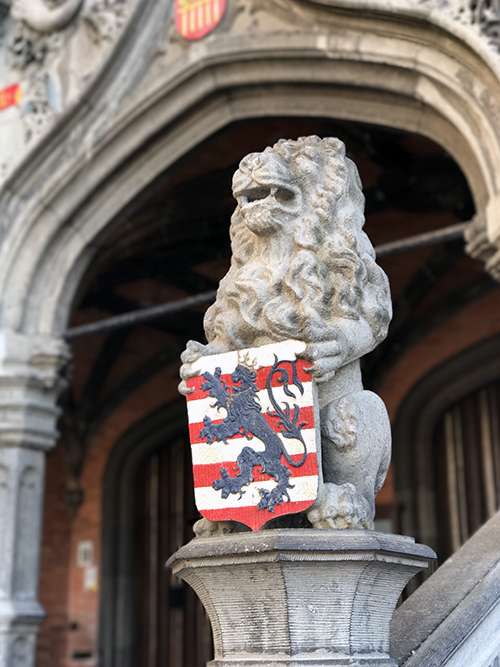 Whereas Amsterdam plays host to droves of hen parties, stag parties, and college students on break, Bruges’ visitors seemed of a more — ahem — mature inclination. I’m guessing it’s a popular stop on European bus tours that cater to older travelers, because I saw quite a few groups of pensioners following a tour guide’s bobbing umbrella around the city. To my partying-averse self, that was a good thing (even if I did have to endure the slow-moving groups clogging up the sidewalks more than a few times). I’ll take a dozen retirees dawdling through a guided tour over a dozen liquored-up frat boys any day of the week. And about that fear of boredom: Bruges may be small, but there’s lots to see and do. Even though I took it easy on the touristing front, I was never bored. I visited just a few hotspot locations and instead spent my time enjoying the sunshine, meandering through the blissfully bike-free streets (well, relatively bike-free), and eating. Always eating. 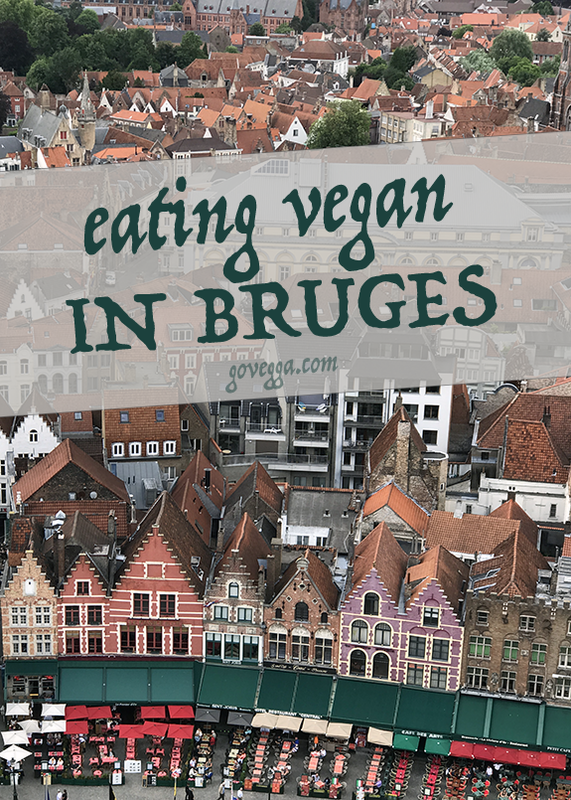 It’s surprisingly easy to find vegan food in Bruges, especially considering that this is a relatively small city. I spent two nights and barely two days there, so I didn’t get to sample everything, but I was so impressed with the places I did visit. Read on for details and a list of the eateries I didn’t get to try. If you are in Bruges, go to #food (pronounce it “hashtag food”) for dinner. If it’s sunny, ask to sit outside — there’s a hidden patio out back, so you can enjoy the sun while you enjoy some fantastically creative food. This relatively new restaurant does serve meat, but it’s also incredibly vegan-friendly. Everything is clearly labeled, and the servers get it when you say you’re vegan: after ordering my vegan entree, my server brought me a bowl of spicy popcorn and reassured me that it was vegan even before I had a chance to ask. Now, calling this dish “lasagna” is a bit of a stretch… but who cares when it tastes so good? Thinly sliced zucchini, pineapple chunks, and coconut made up the bulk of this souffle-esque casserole-y dish. (It really defied description.) I wasn’t sure whether I’d like the sweet ‘n sour flavor profile, but it was absolutely perfect alongside the tropical ingredients. And thanks to a generous topping of pomegranate seeds, toasted coconut, edible flowers (! ), and passionfruit, there were plenty of textures to set off the more souffle-like main dish. The fruity salad on the side was also a masterpiece, featuring a very light vinaigrette over salad greens, tomatoes, grated carrots, golden raisins, strawberries, grapes, orange slices, and a gorgeous Rainier cherry on top. The fact that I thoroughly enjoyed this salad must be a testament to my more refined palate, right? Because this combination of fruit and veggies in the same dish would not have met with my approval just a few years ago! 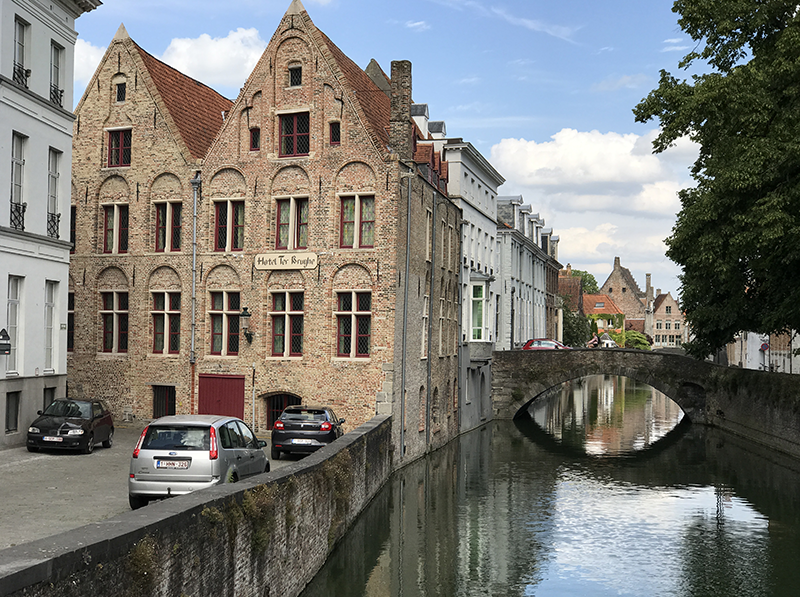 #food is a bit on the pricey side, especially for Bruges, but I considered it well worth my money for the attentive service and the thoughtfully prepared dishes. I was seated by a large British family who ordered quite a few different dishes, and to a person they all raved about their meals. My only regret: not ordering dessert. But! On the way out, the server (who I believe is the owner) handed me a raspberry aquafaba meringue. “For our vegan guests,” he said. What a treat. Editor’s note, 06/2018: #food has moved locations since I visited, but it’s still up and running and seemingly more vegan-friendly than ever! A few quirks of Royal Frituur: To sit at the small lunch counter, you’ll need to buy a drink (hence my sparkling water in the photo above). It’s also cash-only. Everything is relatively inexpensive, however, so it’s a great place to use up those euro coins burning a hole in your pocket. If the weather’s nice, forego the lunch counter and head to the park just around the corner. You can find an empty bench and take a gander at the Sint-Janshuis windmill, which is still used to grind flour today. Given my short stay in Bruges, I didn’t get to try too many veg-friendly joints. The city happened to be hosting a food truck festival starting the Friday I was there, and all the flyers advertised vegan food. So I visited the festival and grabbed a couple of vegan momos for lunch on Friday. They were tasty, but they also meant I missed out on another restaurant visit. Oh well. Here are a few other places that never made it off my list and onto my itinerary. Books and Brunch: Used book store and tea room with vegetarian and veganizable options. Only open 9 to 5, so best for breakfast or a light lunch. De Bron Vegetarian: Small vegetarian eatery offering a single main dish each day. Cash only. De Plaats: I tried to hit up this centrally located vegetarian restaurant on my first night, but it was unexpectedly closed (according to the hand-written sign out front). HappyCow reviews are mixed, but I thought it looked cute. 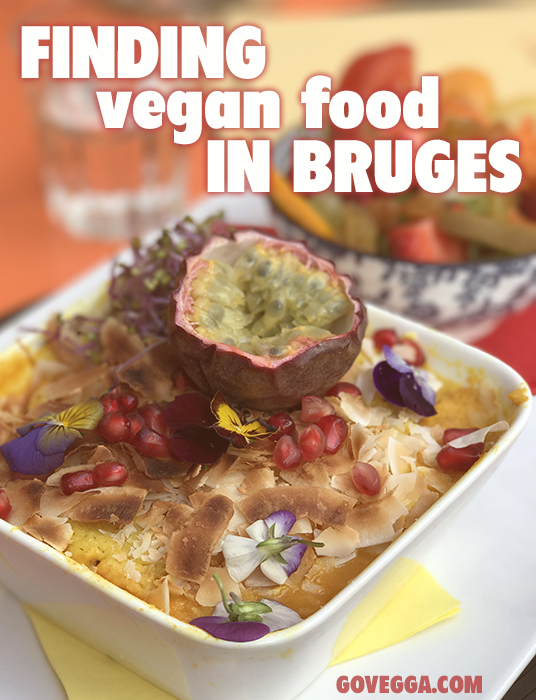 For a wonderfully comprehensive resource of all things vegan in Bruges, check out Trudi’s list on the Bruges Vegan blog. Thanks for checking in — and what a great resource! I’m going to add it to my post. I can’t wait to return to Bruges!